The 17th race of the America's Cup Match is scheduled for September 22nd. About 4 weeks away. The first to win 9 races - I guess - will win the America's Cup. Imagine if Team New Zealand wins. Who or what will be responsible for organising the public contribution to hosting the next America's Cup Regatta, which would be held in 2016? Last time New Zealand hosted the America's Cup it was held in Auckland, and it was one of the triggers for the Viaduct development, and for the development of competing syndicate bases on land - some on Wynyard Quarter - others located around the Waitemata Harbour. In 1995, the Royal New Zealand Yacht Squadron syndicate Team New Zealand, skippered by Russell Coutts, first won the challenger series in NZL 32, dubbed "Black Magic" because of her black hull and uncanny speed. Black Magic then easily defeated Dennis Connor's Stars and Stripes team, 5–0, to win the cup for New Zealand. The run-up to the 1995 Cup was notable for the televised sinking of oneAustralia during the fourth round robin of the Louis Vuitton challenger selection series, with all hands escaping uninjured. The 1995 defender selection series also had the first mostly female (with one man) crew sailing the yacht USA-43, nicknamed "Mighty Mary". 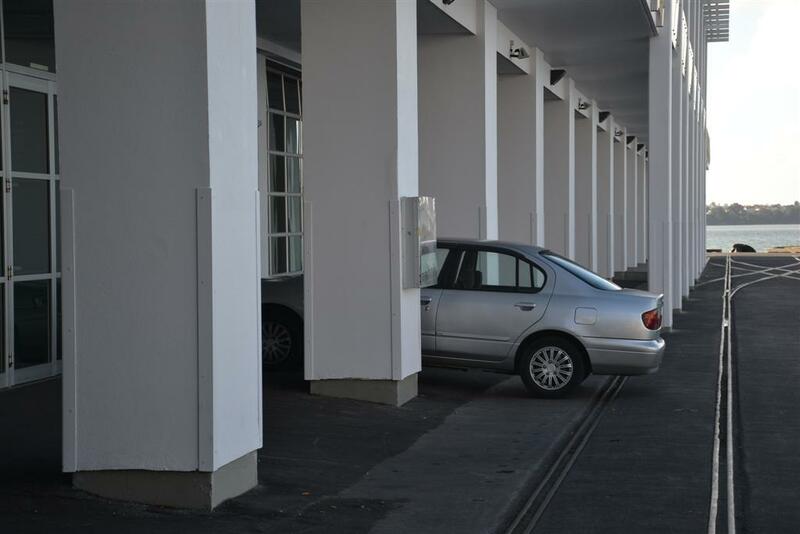 In March 1997, a person entered the Royal New Zealand Yacht Squadron's clubroom and damaged the America's Cup with a sledgehammer. The damage was so severe that it was feared that the cup was irreparable. London's Garrards silversmiths, who had manufactured the cup in 1848, painstakingly restored the trophy to its original condition over three months, free of charge. In 2003, an extra 20 cm was added to the cup's base to accommodate the names of future winners. So you can see from this that New Zealand held the America's Cup - mostly in Auckland - from 1995 to 2003. Eight years. And during those eight years a lot of development occurred in and around Auckland's waterfront. Fast forward to Rugby World Cup. For a variety of reasons Central Government seized the waterfront planning initiative for this event. Auckland Regional Council was focussed on Wynyard Quarter planning. Auckland City Council was focussed on the stadium. Central Government wanted Party Central somewhere. 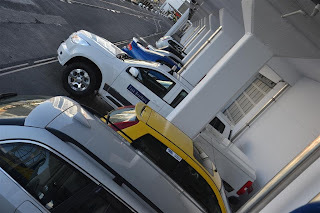 Queens Wharf was an on-again, off-again political football, until Central Government pushed for its purchase in 2010 from Ports of Auckland Ltd.
Then Central Government foisted its Rugby World Cup Empowering legislation on Auckland. Purpose: "The purpose of this Act is to enable applications to be determined expeditiously for activities or facilities reasonably necessary for the proper conduct of the Rugby World Cup 2011..." and "empowers the Minister, subject to a recommendation of the Authority, to grant urgent approvals for activities and facilities in circumstances of urgency that, for good reason, were not foreseen...."
Auckland needs to avoid any action replay of this sort of Central Government "assistance" in the event Team New Zealand wins the America's Cup. A more or less pedestrianised Quay Street. A Light Rail link between Wynyard Quarter and Queen Street. 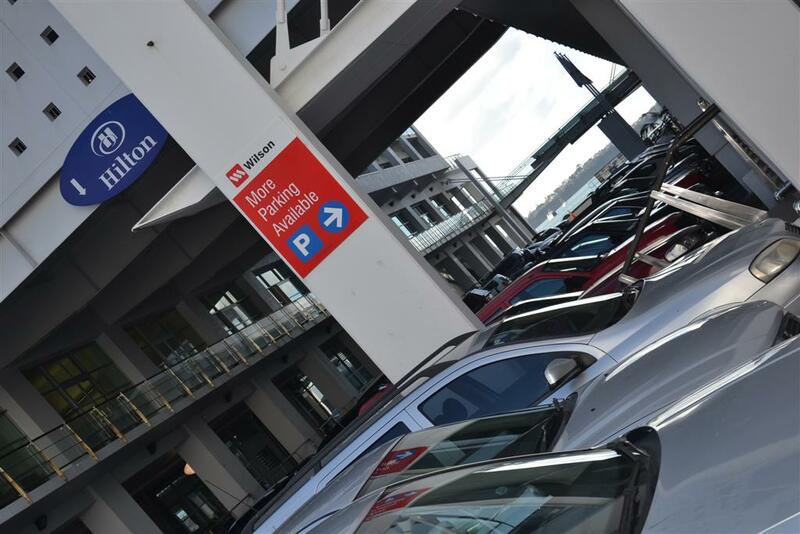 Pedestrian priority access across Quay Street to Princes Wharf and Queens Wharf. To deliver this sort of outcome will require joined up thinking and implementation planning between Auckland Council, Auckland Transport and the Waterfront Development Agency. Go to it guys. A little bit of "just in case" planning is called for. Friday 16th August 2013. 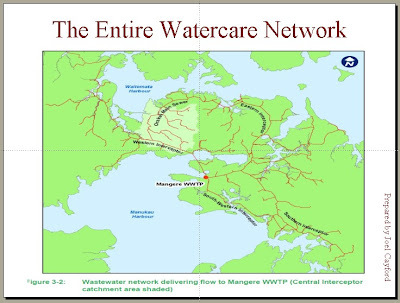 The first "day in court" (Whangarei High Court) has been had of the judicial review sought by Mangawhai Ratepayers and Residents Association (MRRA) Vs Kaipara District Council (KDC) - essentially over the Council's funding decisions and agreements it made for the EcoCare wastewater system built at Mangawhai Heads. It was an interesting day. The first of several, in all likelihood. Many residents attended day 1. So many in fact that the main court-room of the Whangarei High Court would have been filled to over-flowing. It is note-worthy, that Court staff were permitted to open a second court room to hold additional ratepayers and residents, and to allow MRRA to set up a closed-circuit TV, so that the proceedings could be seen by all. Most residents had no idea what would happen. In fact, day 1 was NOT used for the judicial review. This is because Kaipara District Council applied to the High Court, to have MRRA's main cause of legal action "struck out". This sort of jousting is allowed in the Courts. It permits parties (in this case KDC) to get rid of causes of action from the judicial review. But the judge needs to be satisfied that there are good legal reasons before deciding to strike out any cause of action. should be refunded by the Council. So. 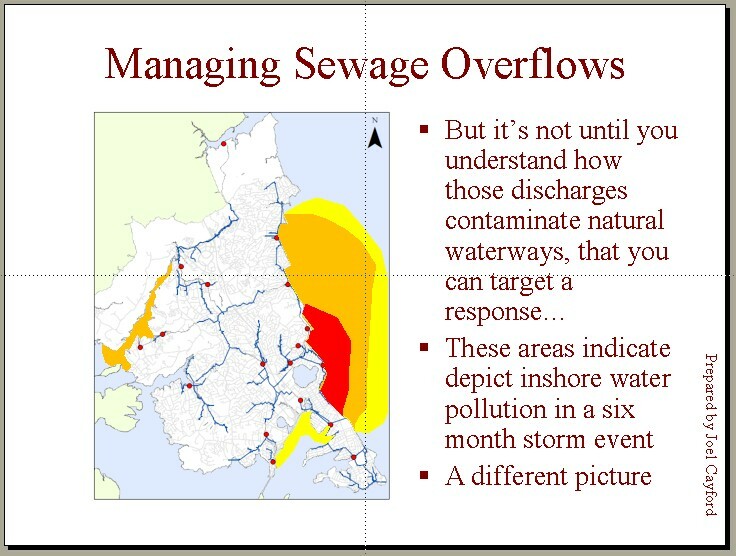 You can see there are 3 main causes of action, 3 main causes for MRRA seeking a judicial review of KDC's decisions. The first of them refers to the agreements that KDC made with banks and with contractors to go ahead with EcoCare. 12. On 24 August 2005 the respondent resolved to: (a) Accept an offer from EarthTech Consulting Limited (EarthTech) to design, construct and operate EcoCare; (b) Accept an offer of a borrowing facility from ABN Amro New Zealand Limited (ABN) to a maximum of $31,000,000 to fund the capital costs of development of EcoCare. 13. On 24 October 2005 the respondent resolved to confirm the direction of a draft statement of proposal for the purposes of s 83(1) LGA for EcoCare. 14. On 26 October 2005 the respondent executed a Project Deed agreement with EarthTech to design, construct and operate the Ecocare facilities (EcoCare Agreement). The EcoCare Agreement was conditional on the necessary resource consents being obtained under the Resource Management Act 1991 for the construction and operation of EcoCare. 15. The respondent’s decision to proceed with EcoCare and execute the EcoCare Agreement was a decision: (a) to which s 97(1) LGA applied;(b) that required prior compliance with s 97(2) LGA;(c) not explicitly provided for in the respondent’s last adopted long term council community plan. 16. On 22 February 2006 the respondent resolved to adopt a statement of proposal for the purposes of s 83(1) LGA for EcoCare and to notify it for consultation under the LGA as part of its proposed Long Term Council Community Plan 2006-2016 (LTCCP 06-16). 17. On 21 March 2006 the respondent notified the statement of proposal for EcoCare (EcoCare SoP) and LTCCP 06-16 for consultation under s 83 LGA. 18. The EcoCare SoP indicated that the capital cost for EcoCare was estimated as $35,600,000, but otherwise did not include the information required under s 84(3) LGA. 19. On 24 May 2006 the respondent resolved to:(a) Adopt a proposal from Beca Limited (Beca) to manage the implementation of EcoCare;(b) Approve, in principle, the purchase of land to be used for wastewater disposal as part of EcoCare. 20. On 7 June 2006 the respondent resolved to adopt the LTCCP 06-16, incorporating the EcoCare SoP and its funding impact statement, as from 1 July 2006. 21. On 25 October 2006 the respondent resolved to endorse an amendment to the EcoCare Agreement (Modification 1) and authorise the Chief Executive and Mayor to execute the document. Modification 1 doubled the scope of EcoCare, increased its capital cost of development and required changes to the funding arrangements previously committed to by the respondent for EcoCare. 22. On 26 September 2007 the respondent:(a) received a report from its Chief Executive that the conditions on the EcoCare Agreement had been satisfied and resource consents obtained for EcoCare;(b) resolved to adopt Modification 1, confirm the EcoCare Agreement and conclude negotiations with EarthTech and ABN to activate the necessary funding arrangements. 23. On 28 November 2007 the respondent authorised the execution of the EcoCare project documentation between it and EarthTech to give effect to the EcoCare Agreement incorporating Modification 1.24. On 7 December 2007 the respondent executed the Amended and Restated Project Deed to give effect to Modification 1. It also executed a term loan facility agreement with ABN for the amount of $53,000,000, which agreement increased the capital funding sought to construct EcoCare over and above the amount originally budgeted for EcoCare as recorded in the EcoCare Agreement and as disclosed in the EcoCare SoP. 25. The respondent subsequently borrowed $57,978,000.00 from ABN to fund EcoCare in accordance with the EcoCare Agreement incorporating Modification 1 (EcoCare Borrowings). 26. The decision to proceed with Modification 1 to EcoCare and to take on the EcoCare Borrowings were decisions:(a) to which s 97(1) LGA applied;(b) that required prior compliance with s 97(2) LGA;(c) not explicitly provided for in the respondent’s last adopted long term council community plan. 27. Modification 1 and the increased capital costs for EcoCare (represented by the EcoCare Borrowings) were never included within a statement of proposal under s 84 LGA for consultation in accordance with the special consultative procedure under s 83 LGA. I provide this detail, so you can see how important to MRRA, the first cause of action is, in its application for judicial review. So it was very important to MRRA that it vigorously defend its application to have these specific KDC decisions judicially reviewed. Now I'm not going to go into the whys and wherefores of all this, or to go into length what happened. Partly because I'm not a lawyer, partly because the matter is before the courts, and partly because it's complicated. However it is a very interesting situation. As far as I am aware, this is the first time many of these fundamental provisions of the Local Government Act have been in front of a High Court judge. So there is the potential for new case law. As an interested layperson, with an interest in public policy, it is of considerable interest to follow this, and to learn how the judge interprets and weighs what is put in front of him. His decision on the strike-out application is expected in about a week. MRRA's defence against KDC's application to strike out this fundamental cause of judicial review action, was painstakingly prepared by MRRA's legal advisers: Kitt Littlejohn and Matthew Palmer, who have drawn together the work and investigations of a number of individuals. 1) The first leg is based on a "black letter of the law" interpretation of what is in the legislation. s117 of the LGA is enforceable - but that does not mean it can be enforced on ratepayers. It only means that loans can be enforced on Council. Further, the LGA provides a receivership framework whereby a receiver can gain access to rates - but only if these are for a lawful purpose. These submissions essentially say that the law - as it is written - could have allowed KDC/Commissioners to not presume they had to get rates from ratepayers, and forced the lenders to take receivership action - which is envisaged by the LGA. 2) The second leg is that the Purpose of both the LGA and the Local Government Rating Act are all about democratic decision-making and transparency. That the fundamental purposes of both of these Acts are in conflict with the idea that it is somehow legal or lawful for KDC to borrow money from a bank - without consulting - and then be legally allowed to force ratepayers to cough up and pay it back. 3) The third leg is that there are a number of constitutional fundamentals and rights at issue. These include the constitutional right to challenge taxes (or rates), and the fundamental right to judicial review of decisions made by public institutions, as set out in New Zealand's Bill of Rights. 4) The fourth leg relates to where and how the protected transactions legislation came from, what it means, and how it should be interpreted in the Local Government Act. This relies on Hansard and matters that I covered in postings here and here. (d) provides for local authorities to play a broad role in meeting the current and future needs of their communities for good-quality local infrastructure, local public services, and performance of regulatory functions. (iii) the reasonably foreseeable needs of future generations. (2) If any of these principles conflict in any particular case, the local authority should resolve the conflict in accordance with the principle in subsection (1)(a)(i). I did want to hear how the decision to defer considering this matter would be dealt with. In fact what Council decided was to defer until a 3 day meeting (28th, 29th and 30th of August - 3 days of peace, love and music I'm sure - with a little over 5 weeks till election day....), all Draft Unitary Plan decisions relating to: significant ecological areas; mangroves; residential provisions (especially the mixed use zone); historic heritage and character; city centre waterfront heights; and Ports of Auckland. Should be a doozy. The agenda item for today's meeting did contain a taste of what Councillors have been advised at the workshop meeting previously held about Ports Expansion Plans. The first 4 slides on this posting are copied from the meeting agenda papers. They illustrate 4 options that were considered by Councillors at the workshop. You will see that Option 1 is called "status quo". As Cllr Penny Webster explained to the meeting today, the words "status quo" mean different things to different people. She recognises that to the person in the street the words "status quo" means what we see in Waitemata Harbour today. To the public - if they say stick with the status quo - it means no more reclamation. 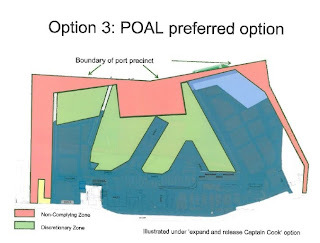 But actually, as Cllr Webster explained, "status quo" includes the large area in green which is the area where POAL can NOW apply for a discretionary status resource consent for further reclamation. Officer Penny Pirrit confirmed this situation at the meeting, stating, "the existing planning documents enable POAL to undertake reclamation activities" - subject to obtaining a discretionary resource consent. It seemed to me, based on the statements of the Councillors who said anything, that there was a recognition that doing nothing was not an option for the Unitary Plan. They had to do something, because the planning status quo is too permissive. There was no information given at the meeting about what Cllrs said about the other options that were presented at their workshop. But the report states that at the workshop "...there was general support for Option 4 (and to a lesser extent support for Option 2)...."
Which is interesting. You can see here the red area that is depicted in Option 2. This would indicate that reclamation was a "non-complying activity" in that area, but still a discretionary activity (subject to resource consent), in the green area. I've included Option 3 here for completeness. Apparently there was little or no support for this option at the workshop. Tangata Whenua representatives wanted to know where the report was about the Economic and Cultural Impact on Maori of the various POAL expansion plans. They had asked for this report way back in April. But it was still not done. Officers indicated the report would be with them before the 26th of August. There was no similar promise around the Stage 2 report from the major ports study. 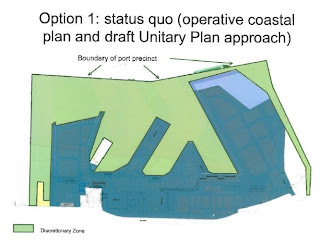 Though Mr Blakely (Head of Planning) indicated that the decision that would be required on the 28th of August would be about the Stage 2 study, AND what to put in the Unitary Plan. Cllr Cameron Brewer spoke at length but appeared to have little understanding of how planning provisions actually work. He referred to Mayor Brown's Saturday announcement as "a call for a cuppa tea" but that "anything we do will be major for POAL future..". Almost as if he's only just figuring that out. Which is good really. Cllrs need to understand what they're doing here. He wanted to know what it would mean if the UP contained a "pencilled in" area for future reclamation, and that the council got the Stage Two report afterward. How would that work? This comment at least signified that Cllr Brewer understood that there was a relationship between Stage Two study (which looks at the costs and benefits of POAL alternatives), and whether Council should "pencil in" these plans. Cllr Wood then opened up and appeared to try and shut the discussion down by moving that the report be received. He did say, "Option 4 will lead to huge reductions".... Man oh man. This is the problem of what the words actually mean. Cllr Webster chimed in at this point with her useful clarification that "status quo" means different things to different people. Cllr Morrison made the most sense on the day. But in the end he appeared to contradict himself. He reminded the meeting that the PWC report advised that some reclamation would "likely be needed at the back-end of 30 years, that the Unitary Plan would have to be reviewed every 10 years, and let POAL demonstrate the efficiencies that PWC also says are there...."
He made a comparison with the RUB or MUL. Interesting point. But then he used this to argue for Option 4 (I think). Much better to use this argument to force POAL to use its existing reclamation more efficiently by NOT allowing any further reclamation NOW, and then in 10 years time review the plan and allow a little bit of expansion - but only if it is necessary. Cllr Walker reminded councillors of what people are generally saying about the Waitemata Harbour, and spoke about efficiency gains. Cllr Anae was the most disappointing. He talked about there being bigger ships. That Auckland would be left behind without more reclamation. That everything would go to Tauranga. Man oh man. My own opinion is that the POAL sense of entitlement to further reclamation - the cuckoo in the Auckland nest approach - needs to be nipped in the bud. The regime has changed, so let there be regime change on the waterfront. 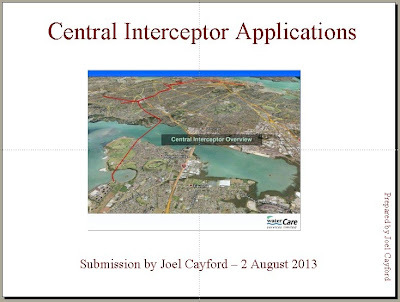 I believe there should be no further reclamation of the Waitemata Harbour by POAL. But that might not be a balanced view. And it would certainly be subject to the findings of a sound Stage Two study. So here's what I think would be a responsible planning approach. 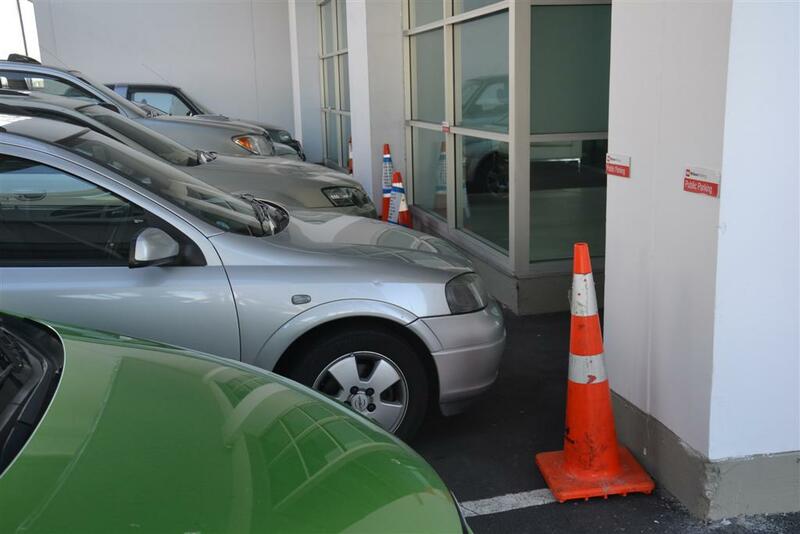 It is time for Auckland Council to direct POAL. It owns it after all. 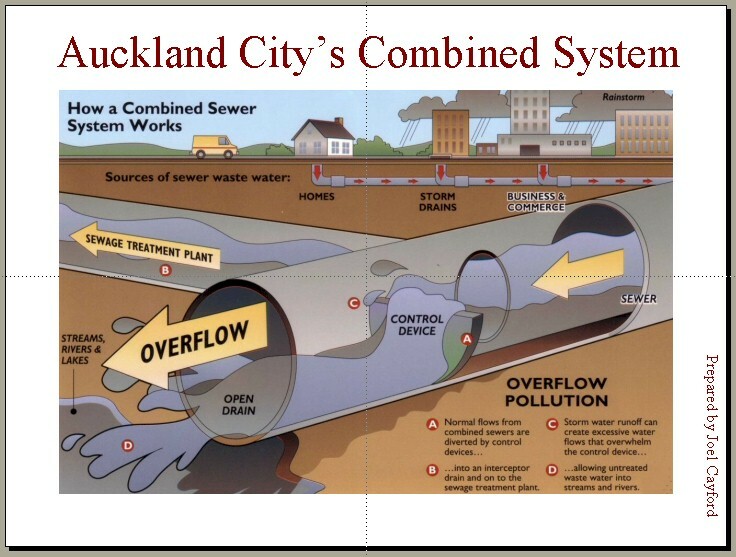 It is also time for Auckland Council to facilitate and regulate its future development. But that must be conditional on POAL behaviour change. POAL cannot continue with its sense of entitlement to getting whatever it wants, whenever it wants. That is why the Stage Two report is crucial Councillors who advocate for POAL being entitled to further reclamation - without Stage Two analysis - are being highly irresponsible. 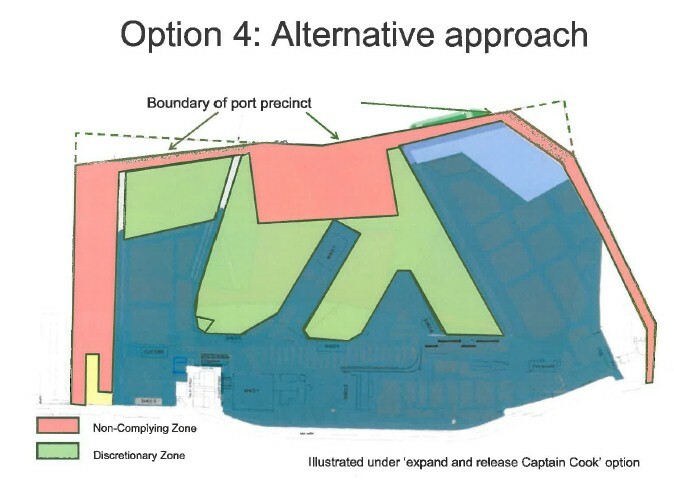 Expansion plans cannot be left to a simple discretionary resource consent application either. In the hands of POAL this would effectively be a rubber stamp for future reclamation - especially with the proposed changes to the RMA. Councillor Morrison is right to draw Council's attention to various matters, including that the PWC report highlights the opportunity for more efficient use of existing reclaimed land; and that the PWC report notes that some further reclamation is likely to be needed in the mid to long term future. Most councillors appear to be aware of the need for the Stage Two study - and that the matters to be assessed in that study are not matters that would be addressed appropriately in a simple resource consent application. That is why it is essential, that any Unitary Plan map that provides for any future opportunity for further reclamation, must be very clear about what that planning future is. It must be specific. I would prefer that the planning maps for Ports area show no further reclamation zone - that is they show what is presently permitted by resource consent. A true status quo. 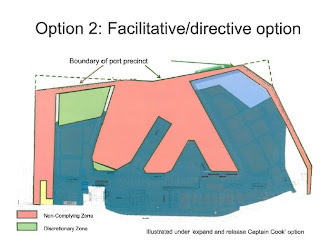 The fallback position would show some sort of Conditional Expansion Zone or Area, and that on the face of the planning map are words to the effect: The Conditional Expansion Zone may be utilised for further reclamation of Waitemata Harbour, after 2023, subject to a discretionary resource consent being obtained AND subject to the Stage Two ports study being completed. This would provide POAL, the public and Auckland Council with certainty. Wynyard and Auckland CBD LRT? So what sort of public transport links will there be to and from Wynyard Quarter? What transport planning and systems will be needed to deliver the 70/30 transport mode split required by the relevant District Plan documents - between sustainable modes (walking, cycling and PT), and private vehicle trips? Already Auckland Transport is redesigning Auckland's bus network, for example, and this might affect future service options into and out of Wynyard Quarter. This optional route for LRT is interesting. It does require another - longer bridge - but it does protect the Quay Street alignment for the sort of waterfront pedestrian energy Auckland should be able to tolerate and encourage and have more often. It also activates the unsuccessful Waitemata Plaza. And it would be a central transport plank that would enable and inspire the development of Wynyard Quarter Central Precinct - eg it could run along Madden Street. Another important benefit of this alignment is that it would take LRT along Custom Street to Queen Street. This would be part of any transformation of Custom Street to being a premier CBD street with the high quality streetscape and amenity that are associated with LRT. This bridge might not be a lifting bridge - which would mean that the most inner Viaduct basin would not be for high masted craft. Such things would need to be weighed of course. But it is essential that the new piece of city that is evolving at Wynyard is well connected, and that the pedestrian environment is respected and developed to the maximum extent. And then there is this alignment option. It may be a bit fiddly going through the small streets of the Viaduct, and impede speed and frequency, but it would avoid the need for another bridge. There is also the option of running LRT along Fanshaw - but that has the Northern Busway and is well served by a fast and frequent service. Waterfront Auckland needs some serious short and long term transport planning to deliver 70/30 split and land use excellence. * “Floatables”. This includes excreta, toilet paper, and other solids flushed down the toilet. This also varies for each sewer line. * Diluted trade wastes. 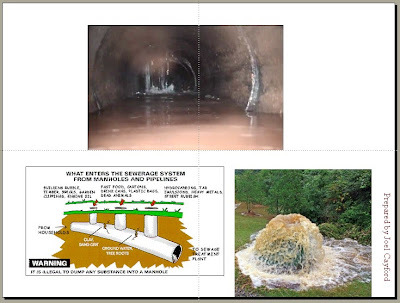 Commercial and industrial trade wastes that are disposed of into sewer lines. Then I introduced my case study example. 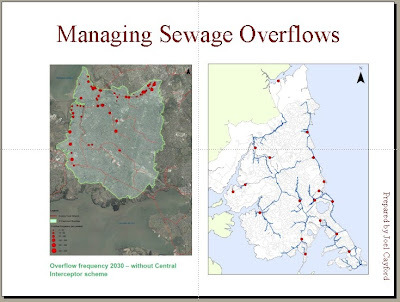 North Shore City's sewer network. North Shore does not have a combined sewer network (CSN). 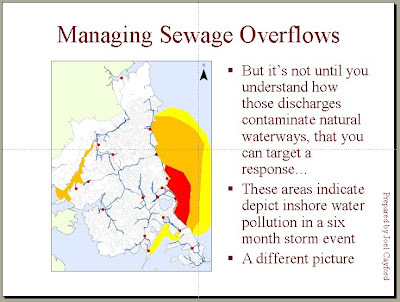 But when it rains North Shore’s wastewater collection network infiltrates stormwater up to 4 or 5 x “dry weather” flow rates, so that some trunk sewers (interceptors) quickly reach capacity… …and cause overflows affecting beaches and streams and amenity. The point being that NSCC sewers act like Auckland's Combined Sewer network when it rains. 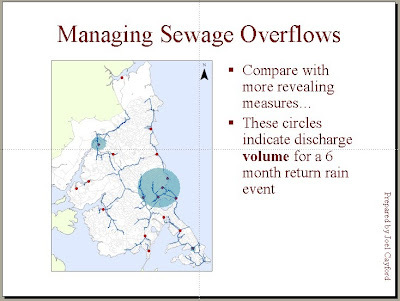 Most North Shore sewage pump stations have “floatables” screens… but not all…. 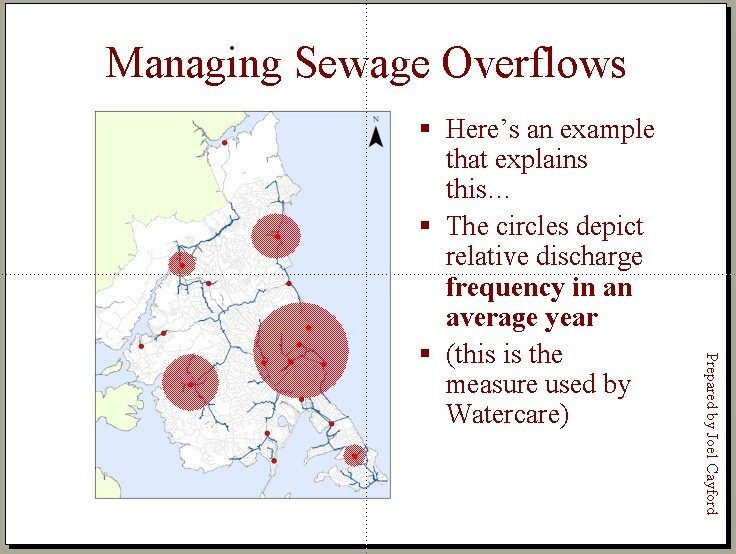 I wanted to explain to commissioners the physics of sewer overflows, in order to talk about how to manage overflows.The map on the left in this slide is the proposed Central Interceptor catchment - with the frequency of overflow points marked in red circles = bigger circle = more overflows/year. 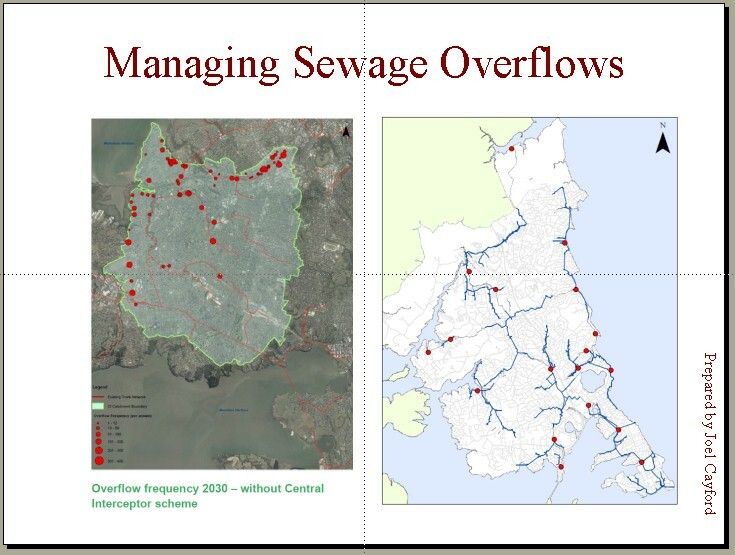 The map on the right shows roughly where North Shore's sewer overflow points were. Frequency is just one measure. But if (as Watercare's AEE says) benefits sought are: public health, amenity values, cultural values and ecological values – other measures are important. 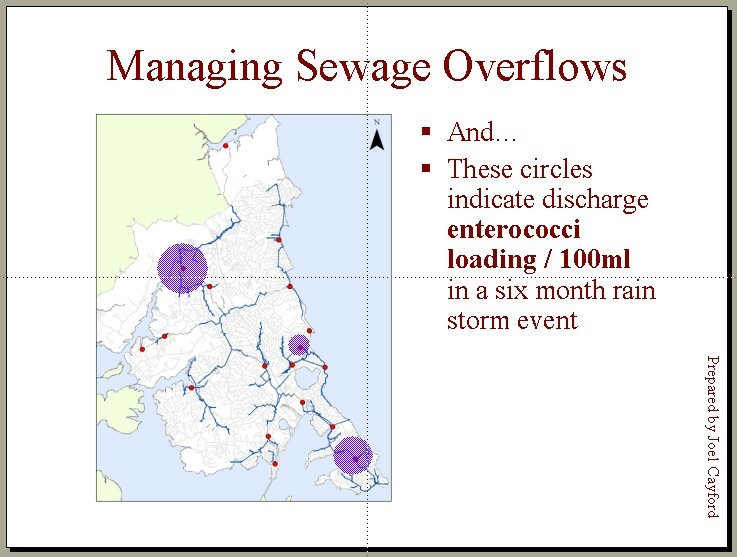 This next sequence of slides explains how North Shore systematically went about measuring the problems caused by its sewer network, before coming to decisions about how to manage those problems. 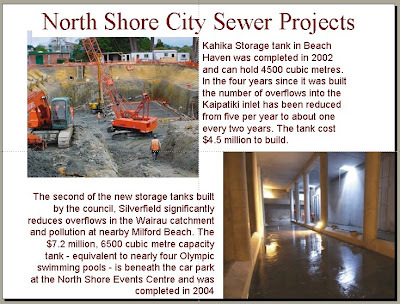 In the period 2000 to 2004 approximately, North Shore City Council planned to spend about $500million making its public sewer network collection system “leak proof”. 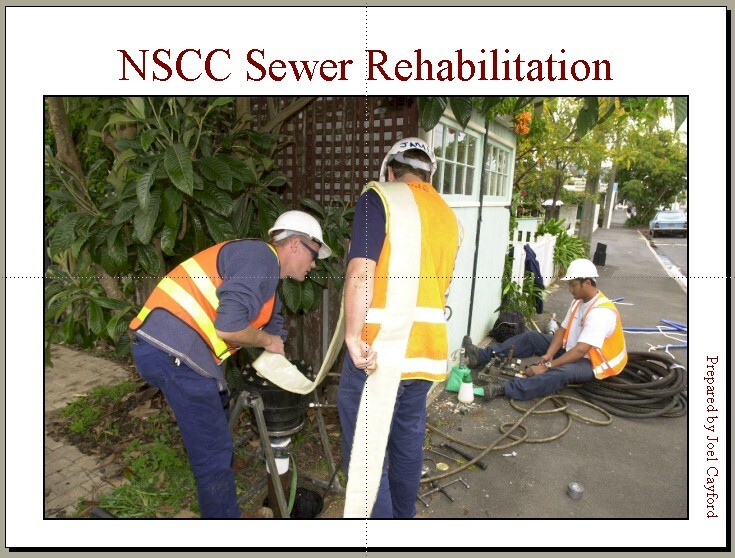 It spent about $50 million rehabilitating Devonport sewers (see pic where resin liners inserted into trunk sewers). Some benefit so far. But other areas of city now have storage tanks underground to reduce overflows. Council spent about $150 million taking treated effluent 3km offshore, and expanding its outfall capacity. 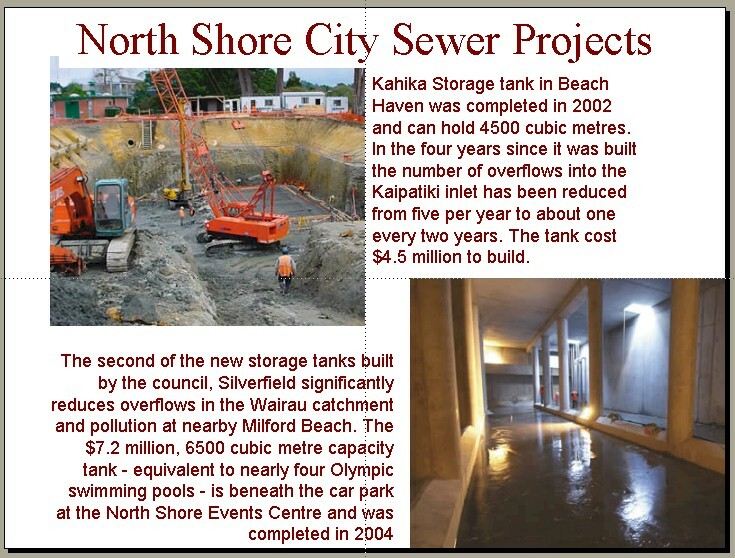 Some storage was also provided in Browns Bay using a large pipe laid in a street corridor. These images show a couple of the storage facilities. The one bottom right shows two workmen at far end - gives an idea of scale. These underground storage facilities receive sewer overflows while sewer interceptors and trunk sewers are at capacity (as happens to Auckland's combined sewers). Intense rain storms pass after a short time. 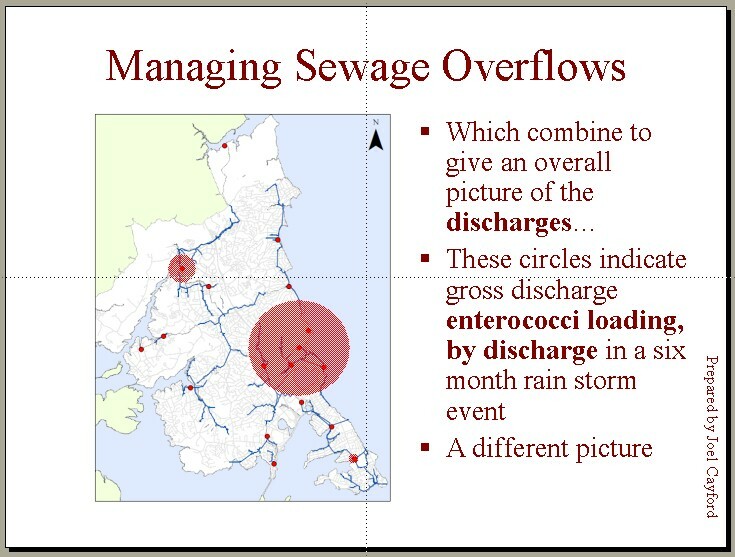 Sewers take a couple of hours to pass their contents to wastewater treatment facility. And reduce in flow. THEN the contents of storage tanks are pumped. This sort of approach recognises that rainfall events are not uniform. There are weather bombs. Localised extreme rainfall. 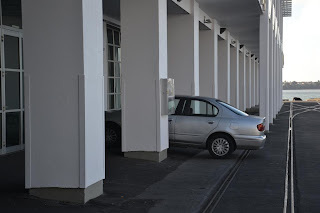 Localised capacity exceedances. 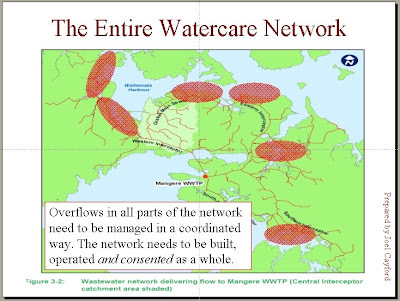 There is need for SCADA type network control to direct flows to parts of network with capacity. 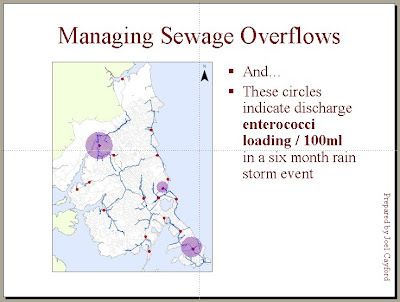 The priority is to minimise pathogen contaminant loading in environment from network discharges, for the range of anticipated weather events expected. The objective is the identification of the range of mitigation measures/fixes that will best deliver This requires a comprehensive understanding of the behaviour of the entire existing network. 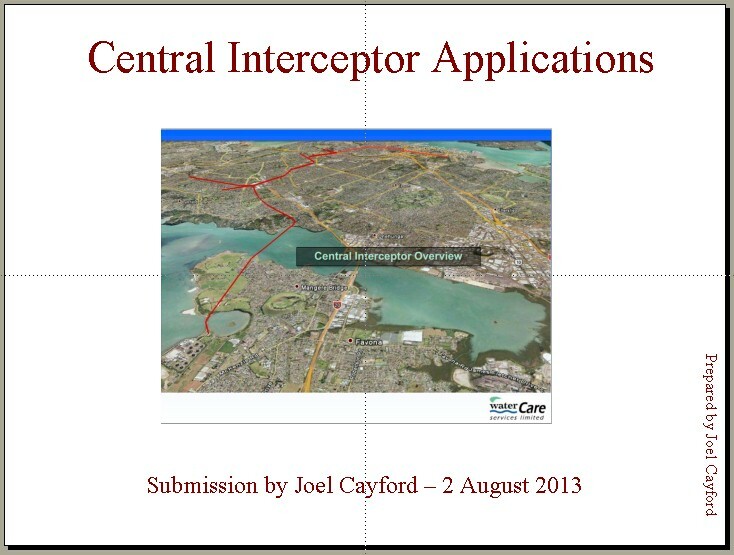 The problem with Watercare's Central Interceptor is that the work hasn't been done to demonstrate that it's the best solution to the problem Auckland has. 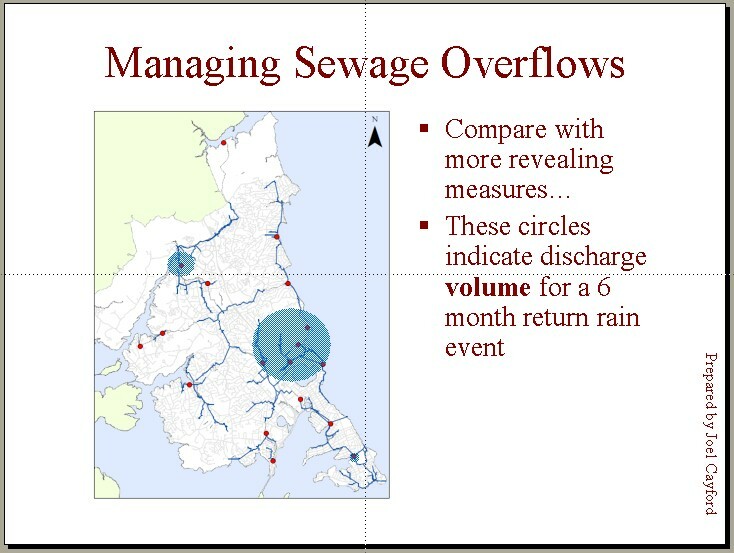 The Central Interceptor approach appears to be driven by the need to minimise the number of discharges (big and small), rather than the need to minimise discharge of contaminant loadings (volume x concentration) There is insufficient quantified information provided relating to combined sewer overflow effects on the receiving environment, in different rainfall events. 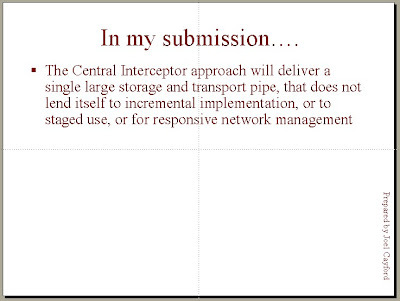 While I accept that the Central Interceptor tunnel is likely to provide significant benefits for a part of the trunk sewer network, these need to be considered conjunctively with proposals for the whole network. 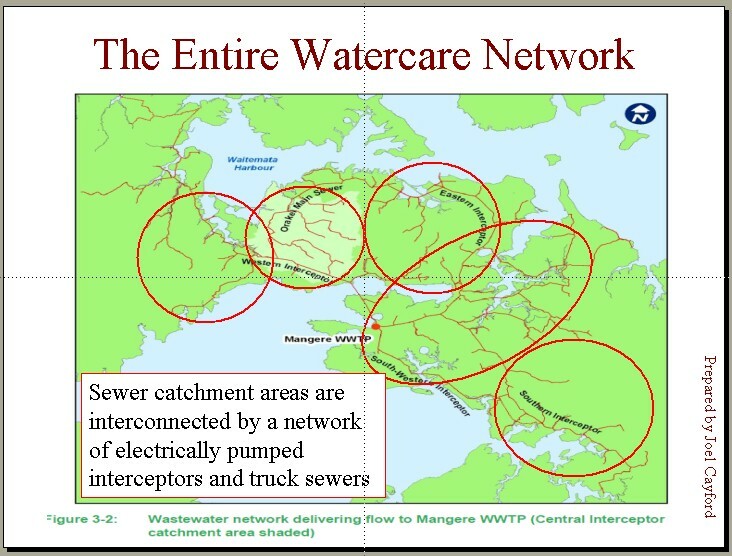 This map is drawn from watercare's AEE. 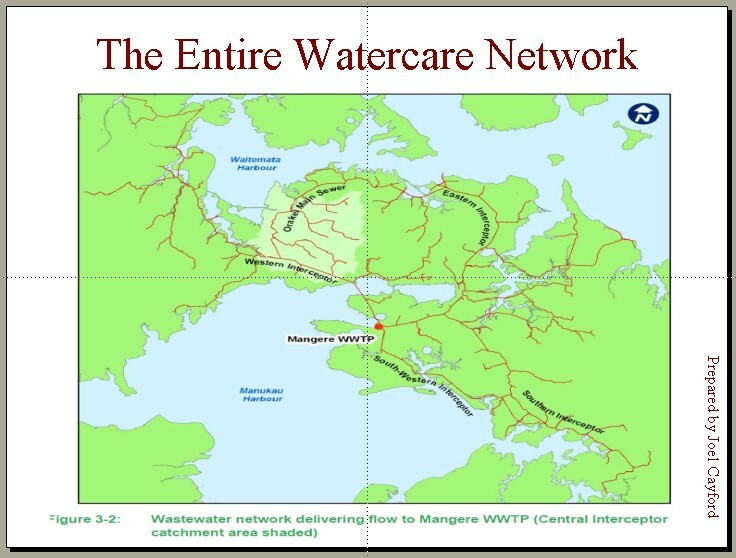 It shows the whole sewer network - that leads to Mangere WWTP. The light green area is the catchment proposed to be served by Central Interceptor. 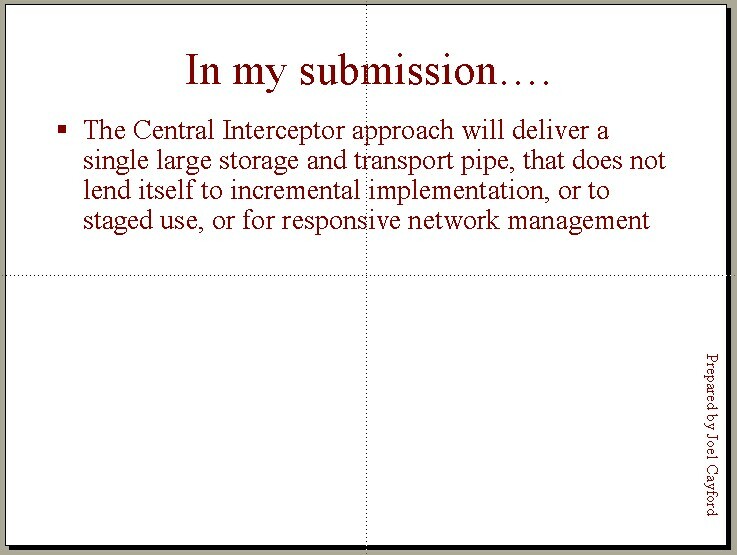 What makes me really concerned is that Watercare is expecting commissioners to consider the Central Interceptor in isolation from the rest of the network. I paraphrased offer's words from above.. However, I understand that the RMA requires that all consents relating to an activity be applied for together – to allow integrated and coordinated consideration by consenting authority. North Shore City Council’s network consent application provided for that, and, in my opinion, delivered an integrated set of permits, management plans, reporting requirements, and conditions. The proposed Central Interceptor tunnel is a single project whose effects and performance need to be assessed alongside other proposed and budgeted projects planned to improve the environmental performance of the whole network. 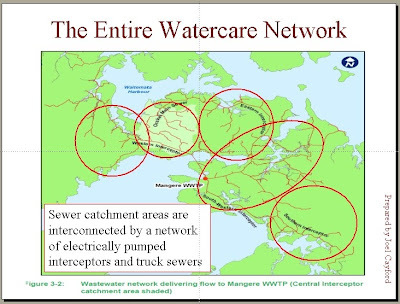 There is no timetable or requirement that I am aware of for Watercare to obtain a network discharge consent for either this part of its trunk sewer network, or for the whole network. It is ONLY through a whole of network discharge consent process that the consent authority (Auckland Council) can consider the function and effects of the network in an integrated and coordinated way – and thereby gain some certainty regarding outcomes and applicant actions. 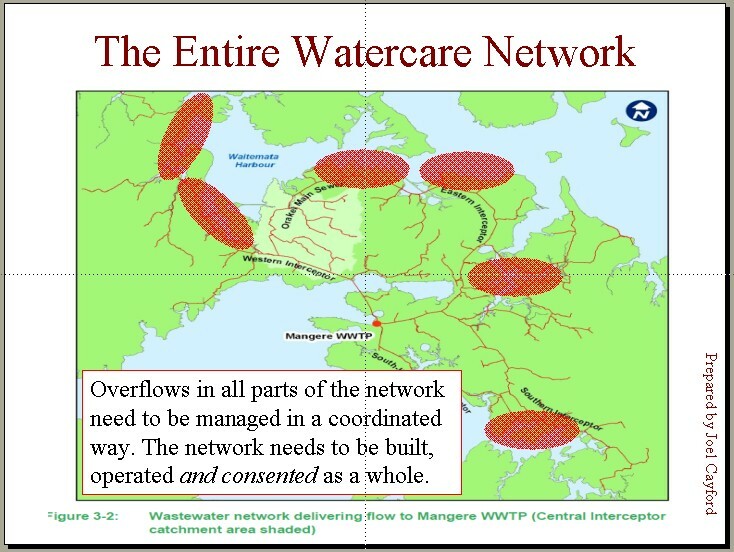 Therefore, EITHER the present application must be declined OR the present consents need to be interim, or conditional upon Watercare obtaining network discharge consents for interconnected and conjunctively operated networks. I await the commissioners deliberations with interest. 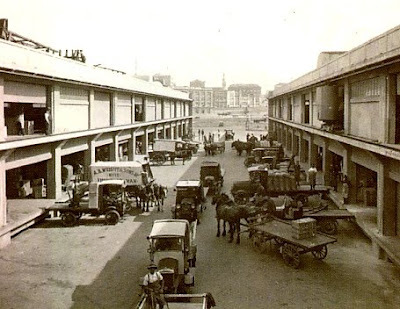 This is how Princes Wharf looked in its days as a working wharf. How it got developed, and the way it has been developed, is a sobering case study of Auckland Waterfront Planning. So interesting in fact that I've decided to put some serious time into it, and dig into archives. This post gives a little taste. 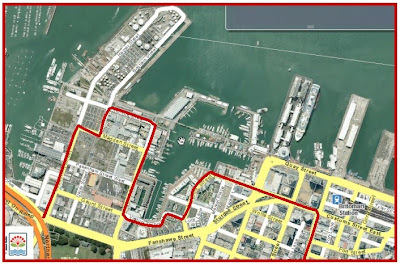 I was an Auckland Regional Councillor from 2004 until 2010 - the period of history when the Western Reclamation (sometimes known as Wynyard Quarter/Tank Farm) transferred from Ports of Auckland to Auckland Regional Council ownership - and Queens Wharf. Councillors had the new (for many of them) task of getting to grips with this new challenge. Part of that meant we went on site visits to previous waterfront development projects. For example Princes Wharf and the Viaduct Basin. While I was on ARC I asked various Councillors who had been around when Princes Wharf redevelopment started, how it had happened. I was aware that ARC had planning jurisdiction over Princes Wharf - because it is within the coastal environment (not on land). There was a little buzz of interest from the media when Cllr Paul Walbran went to the end and sat in a public area to demonstrate that the rather constrained viewing area was indeed public, but given the level of public interest there has been in Queens Wharf and in Wynyard Quarter, I could not understand what had happened at Princes Wharf. How it been permitted without a whimper? Why had it been such a non-event? 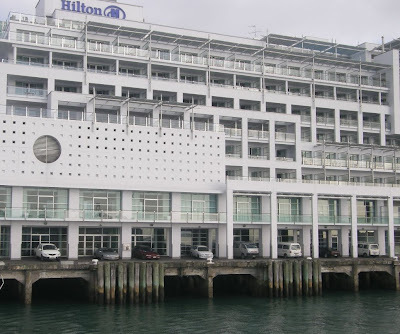 A few weeks ago I obtained under the Local Government Official Information and Meetings Act, the Auckland Regional Council planning report relating to the permits and consents needed by PW Investments Ltd (subsidiary of Kitchener Group) to build what we see on Princes Wharf today. It appears, in an ARC report dated 25 February 1998, that PW Investments Ltd applied for: "approval to construct additions and alterations to existing buildings located on Princes Wharf and to strengthen the wharf structure by the addition of support piles being part of a comprehensive redevelopment of Princes Wharf....."
The report notes that: "the wharf structure is owned by Ports of Auckland Ltd. Ports of Auckland Ltd have subleased to the applicant part of the wharf platform and space above the wharf platform for 98 years." In its assessment of the application, the ARC report states: "... the applicant has designed the proposal to comply with all requirements of the Transitional Regional Coastal Plan (TRCP) and the Proposed Regional Plan Coastal (PRPC).... overall the applications falls for consideration as a controlled activity...."
This was because TRCP states that "complying activities and structures are listed as permitted activities and require no coastal permit" while the PRPC states that: "addition, alteration, or placement of existing structures are to be considered as controlled activity..."
And: "with respect to installation of additional wharf strengthening piles, reconstruction of Princes Wharf is listed as a permitted activity under the TRCP, and as a controlled activity under the PRPC..."
In other words, because of the wording of the application, ARC officers were persuaded that the Hilton Hotel and etc application could be considered "an alteration of existing buildings" and "strengthening of the wharf" it was simply a controlled - even a permitted - activity. However I understand that the new piling had little to do with strengthening the wharf, and much more to do with supporting the weight of the 4, 6 and 8 storey concrete buildings. It is common knowledge that the RMA requires that development applications with adverse effects must be notified. So that the public, or affected neighbours can understand what is intended and make submissions. So what happened here? The ARC report quotes Rule 27.5.2 of the PRPC which appears to relate specifically to Princes Wharf and states: "...an application for a resource consent will be considered without notification.... subject to the written approval of the Auckland City Council..."
Apparently there was regular liaison "on matters of process" between ARC and Auckland City Council officers "during consideration of the application". 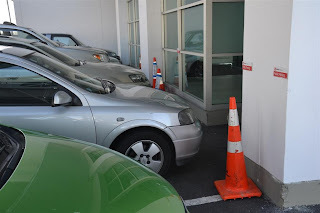 The ARC report notes: "on the receipt of the written approval of the Auckland City Council, it was determined that no special circumstances justifying notification of the application existed." and "The ARC Manager, Coastal Resources accordingly exercised his delegation in respect of section 94(1) of the RMA and determined that the application be processed on a non-notified basis." Interestingly, the report notes that: "Ports of Auckland Ltd has advised by letter dated 15 December 1997 that as owner of the wharf and lessor of wharf buildings and space to the applicant they consider themselves to be an affected party.... and advised that it has no objection to the application, and that it has no requirement the application be notified..."
Man oh man. Are we surprised by that? Of course not. Ports of Auckland stood to make a tidy capital sum from the developer, but only if the developer could build what it wanted. Asking for the application to be notified would invite unwanted attention from the public. So now I understand why there was so little public debate. The public was not invited to consider the matter. The ARC was persuaded it did not need to notify the application. necessary permits and consents were granted and signed off by officers behind closed doors. The posting (above) introduces the Auckland Regional Council's regulatory consideration of the plans to redevelop Princes Wharf. These are clearly problematic. The design and appearance report has been used to guide the ARC's assessment of design and appearance and public use in determining the application. The quality of provision for public access and use has been addressed in the certification report. The report notes the use of colonnades of 2.1 metres in width along the entire north south length of the seaward side of all six buildings, and a similar colonnade of variable width and elevated 1.1 metres above the central street along the sides of the buildings facing the street. These colonnades will provide pedestrians with a sheltered pathway along the wharf no matter what the direction of wind and/or rain. impeded by "spill over" of uses such as outdoor seating from adjacent tenancies. 12. All colonnade spaces between the exterior wall of individual tenancies and the outer face of the columns supporting the first upper level, around the entire perimeter edge of the development and along both sides of the central street, shall be set aside as an accessway for the use of the public. 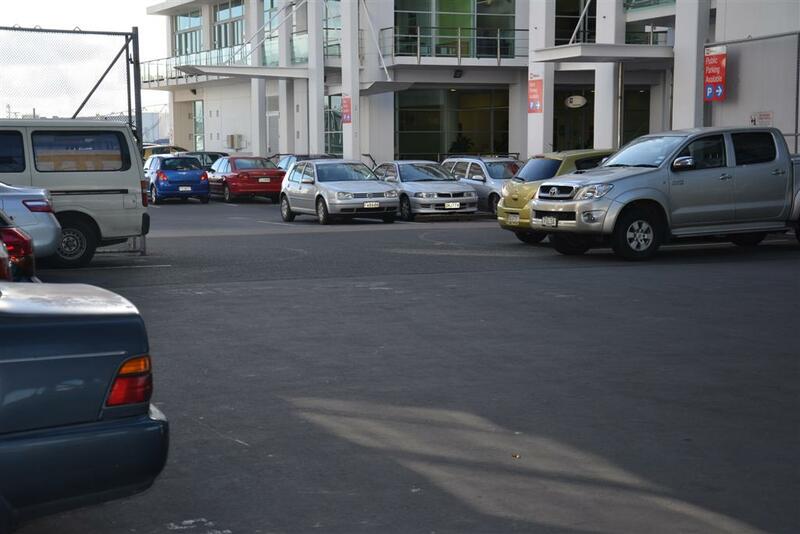 The following photographs were taken today (Monday 5th August 2013). They show some of the creeping privatisation that has occurred on Princes Wharf. They also show creeping non-compliance with the original conditions of consent. The condition states: "All colonnade spaces.... around the entire perimeter.... shall be set aside as an accessway for the use of the public." 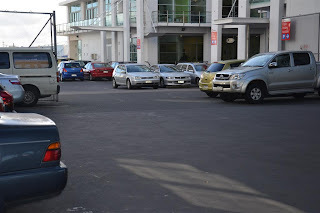 How can this be interpreted as permitting "public carparks"?